The grants were selected through FFB's annual call for research proposals from individual investigators. Seventy scientists submitted requests for funding. Applications were reviewed by FFB's Scientific Advisory Board, which is comprised of the world's leading retinal experts. 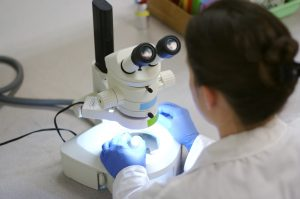 "Many of the funded research projects are cross-cutting, meaning they have the potential to benefit a broad range of people, independent of the mutated genes causing their retinal diseases," says Stephen Rose, PhD, FFB's chief scientific officer. "Also, some projects address a critical gap in our understanding and modeling of disease, and have potential to move the field forward in a significant way." Dr. Lipinski is developing a gene therapy to prevent the degradation of proteins that leads to the death of cones, the photoreceptors that provide central vision, vision in lighted conditions, and the ability to read and drive. Such a treatment has the potential to help people with retinitis pigmentosa, Leber congenital amaurosis, and Usher syndrome by working independent of the patient's gene mutation. Optogenetic therapies bestow light-sensitivity (visual function) to surviving retinal cells after photoreceptors are lost to advanced retinal diseases such as retinitis pigmentosa, Usher syndrome, and age-related macular degeneration. However, many current optogenetic therapies in development have limited light sensitivity and will only work in very bright settings. Dr. Flannery's team is developing optogenetic approaches that will work in a broader spectrum of lighting conditions and potentially provide better perception of details than other optogenetic alternatives in clinical trials. One concern with retinal cell transplantation is a harmful immune response to the newly introduced cells. Retina microglia are first-responder immune system cells that help the retina to recognize and fight foreign substances. While this is a normal biological defense mechanism, this response can adversely affect the transplantation of healthy cells into the retina. Dr. McGill is investigating drugs that can inhibit microglia when retinal pigment epithelial cells (RPE) are transplanted to treat retinal conditions such as age-related macular degeneration and Stargardt disease. VLC-PUFA Therapeutics for Dry AMD and Dominant Stargardt Disease Paul Bernstein, MD, PhD, University of Utah Very long-chain polyunsaturated fatty acids (VLC-PUFAs) are non-dietary fats that are uniquely found in the retina and just a few other tissues in the human body. They are believed to be essential for the maintenance of photoreceptors. Mutations in the gene ELOVL4 lead to depletion of VLC-PUFAs and autosomal dominant Stargardt disease. Dr. Bernstein is working with lipid chemistry specialists at the University of Utah to develop potential VLC-PUFAs treatments to be tested in the lab. Earlier studies suggest that VLC-PUFAs may also be beneficial to people with dry age-related macular degeneration. Identifying Genetic Modifiers that Affect Severity of Stargardt Disease Frans Cremers, PhD, Radboud University Medical Center, Netherlands Autosomal recessive Stargardt disease is most often caused by mutations in the gene ABCA4. However, the severity of vision loss varies widely in patients, even between siblings with the same mutations in the same family. Researchers believe there are other genetic modifiers that impact disease severity. Dr. Cremers and his team are genetically analyzing Stargardt disease in families and sibling pairs to identify potential modifier genes, which may also be targets for vision-preserving therapies. Large Animal Model Development for Usher Syndrome 1B Martha Neuringer, PhD, Oregon Health & Science University Animal models for Usher syndrome have been of limited use, because they don't exhibit vision loss (only exhibit hearing loss). Dr. Neuringer and her colleagues are using the gene-editing technique CRISPR/Cas9 to develop a large animal model of Usher type 1B, which is caused by mutations in the gene MYO7A. She believes that these animals will exhibit vision loss and will therefore be useful for testing potential Usher 1B therapies.